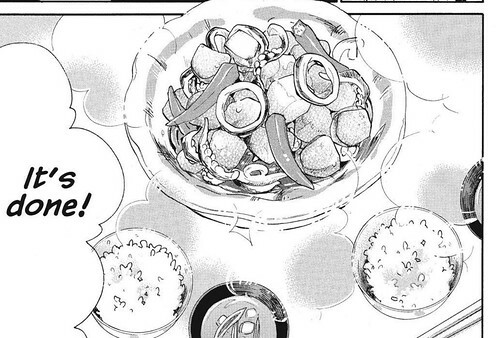 For my maiden post, I’m excited to share my trial of Squid and Taro Stew from Sweetness and Lighting (甘々と稲妻, ch.8, vol. 2). It’s a manga by Amagakure Gido and features a widowed father who is learning to cook home-coooked meals for his adorable daughter, Tsugumi. He seeks the help of his student, who is daughter of a local restauranteur and TV chef. She’s not good in cooking either but together, they manage to try recipes and share delicious meals. 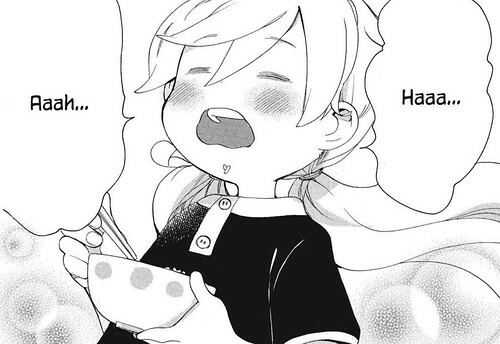 This manga is super adorable and the recipes looked super easy. After reading it from Crunchyroll, I just wanted to try a recipe from the series. Hence, here I am trying one dish. 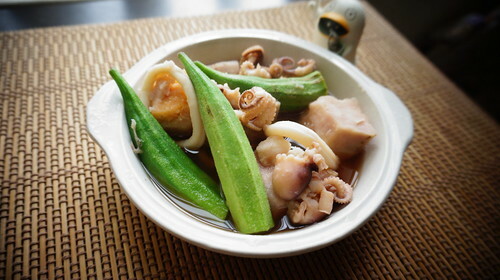 The recipe is Squid and Taro Stew (イカと里芋の煮物), a dish that Tsumugi requested from her dad after he asked her for a dish that her mom made that she wanted to it. To be honest, it seemed like a difficult dish and I think it’s a dish that’s probably most convenient to friends who live in Asia where squid is cheap and taro is abundant. I actually substituted fresh squid for fresh octopus and frozen squid for this but it still turned out great. And lol, taro here in Wollongong costs $10/kg which is CRAZY expensive. ; w; Taro, you’ve become so precious to me. 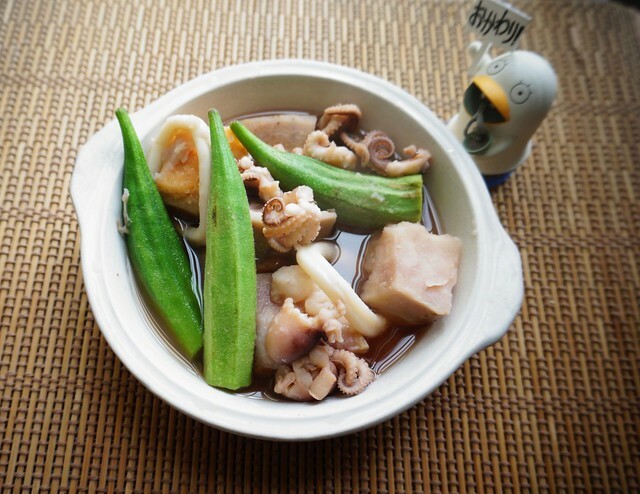 A light stew of taro and squid in sweet soy. Peel the taro while it's dry then cut it in blocks. Then give it a wash.
Cut the top of the okra. If you bought a whole squid, clean it by separating the head from the main body, taking out the 'beak' and cartilage of the squid, cutting the squid body into rings and then cutting the tentacles from the 'head'. If you bought frozen squid, make sure to thaw your squid first before cooking. Put 'Group A'into a pot and boil on medium heat. Add the squid rings and cook until the sauce boils again. Take them out then drop the tentacles in the stock for a minute before taking them out. Place the taro in the sauce and cover it with a drop lid. As soon as it boils, lower the heat and simmer for 15-20 minutes. Once the taro is soft, season and then add the cooked squid. Add the okra in the sauce and let it simmer for 2 minutes before turning off the heat. Place the squid and let it cook in the remaining heat and absorb the flavors for another 10 minutes. When boiling the squid, keep watch. If you have the large squid, then you can wait for the sauce to boil. If your squid is smaller, you might want to check if the meat has hardened a bit before the stock even comes to a boil. You must be careful about overcooking the squid else you'll be eating rubber. If you're in no rush to eat this dish, it's best eaten cold! I feel ya, Tsugumi. It was wicked good. I really love this dish. It’s rich in umami which is a flavour profile that’s in between salty and sweet. The cooking technique they pointed really helped the flavors to seep in. In fact, I realise that this dish was much better one or two days later! Although the manga said it was a side dish I actually ate it as a main since the taro was a fluffy yet heavy starch to eat. It was lovely. The taro was pillow soft and the sauce gives it a subtle sea-like taste which works well with the squid. I finally understand why this dish was so memorable to Tsugumi. My only issue is the cooking of the squid. I changed the instructions a bit to accommodate the cooking of the squid. Minutes in cooking is hard to gauge as what we consider high or medium heat might be different. I’ve placed tips in the recipe and changed how to finish the recipe without overcooking the squid. When I cooked this dish, I actually used a mix of octopus and squid. Maybe if I stuck to squid, I’d get the nice chewy texture of well-cooked squid. Mine turned out just a bit gummy which I tend to forgive once the sweet sauce covers my tongue. Still, keep watch of your squid! I actually made a video of this dish. I had aspirations to make a youtube video of my experiments for manga cooking but my kitchen is too small and I’m not happy with our kitchen’s lighting. Maybe when I have a better kitchen or a better lens, I’ll make a video of my experiments. For now, I hope you don’t mind that I’m sticking to this. If you have recipes you read and manga and think I should try, just leave a comment or holler over at twitter and let me know a recipe you’d like for me to try! Just make it. XD It’s easy (and cheap!) to make this back home. I was just googling around to see about an alternative for this recipe! Like Potato and squid rings… I can’t get Taro anywhere near me! I think using potatoes and squid rings will still work. The texture won’t be the same but I think the potato can absorb the flavours of the sauce well. Let me know how it goes!